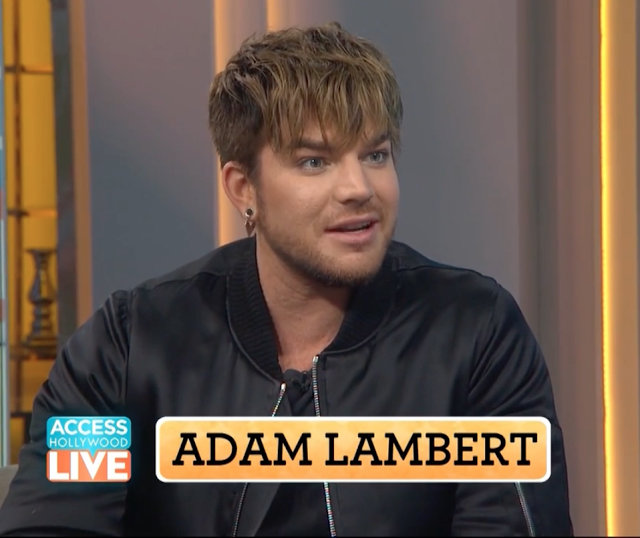 Adam Lambert – A New Doo And A Don’t on Access Hollywood LIVE! You are here: Home / 2017 Queenbert / Adam Lambert – A New Doo And A Don’t on Access Hollywood LIVE! Nothing’s better than seeing Adam Lambert two days in a row on TV. We loved the cocky Adam in a sing-off with James Corden, but now we get to talk with the real Adam –with a new doo, on Access Hollywood LIVE. Thanks @glitzylady for the above screen cap! Daddy Adam is here to stay. The love he has for his new dog Pharaoh oozed out of my TV! And I about laughed myself out of my chair when I heard him talk about his baseball prowess. No “don’ts” for this unfiltered guy! i so excited! I just bought tickets to see Adam Lambert with Queen in DC! WOO HOO!! Great Darlene! Be sure and share with us after the concert! I am hoping to get some video and pictures! Thanks for this post Carol. I did see Adam and James Corben (which I loved) but totally missed this interview. Even after all the years I have adored Adam (since AI) I still find him completely enthralling, exciting, beyond talented and OMG let us not forget (like any of us could) what excellent………………………………EYE CANDY!